How are interests calculated ? The capital you lend to a company is remunerated with the payment of monthly interests. October offers amortizable loans, which means that interests are repaid each month. Most people are used to bullet repayment schemes, which repay interests when the loan comes to maturity. As an example, let's imagine you subscribe to a life insurance policy and invest €100 at an annual interest rate of 6.5%. That means you would receive €6.5 in interest every year. 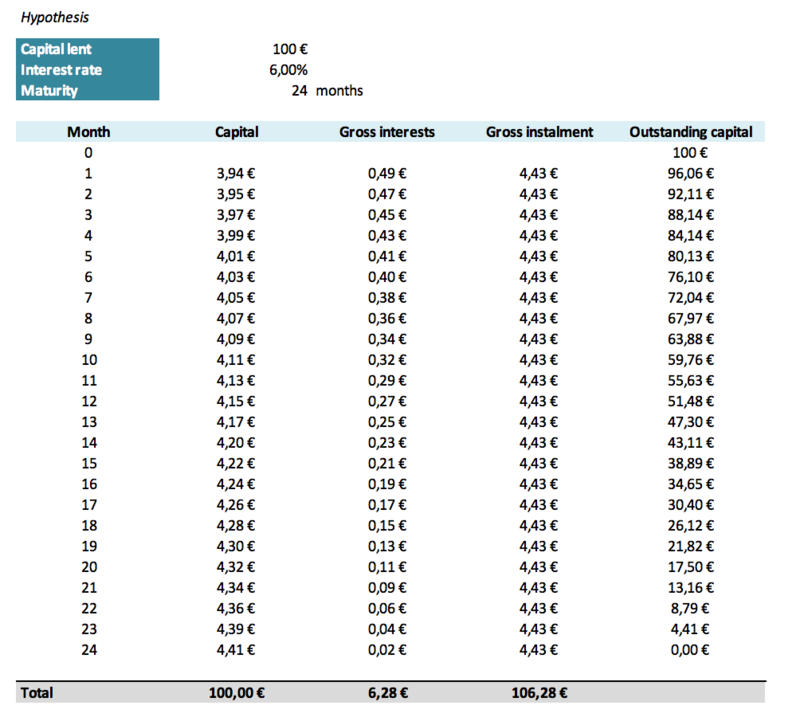 Now, if you lend €100 over 3 years at 6.5% on October, you would not receive €6.5 per year for one reason: the borrower does not owe you €100 for 3 years but owes you €100 the first year, €66 the second year and €33 the third year. October's amortizable loan works the same way as the housing credit the bank would give you : just as the bank cannot claim interest on the repaid capital, the borrower will not pay you interest on the repaid capital. Each month, until the loan comes to maturity, the company repays part of the principal and part of the interest. The interests are calculated by applying an annual interest rate to the outstanding capital (lent capital - repaid capital). The interest rate is determined by October credit committee and is presented beforehand to lenders. Since the company repays part of the outstanding capital every month, the amount on which we apply the annual interest rate gets lower. Therefore, the amount of interests you receive decreases every month. Your monthly repayments are fixed: every month, you will receive the same amount from the company. As the months go by, the amount of capital repaid will increase and the amount of interest will decrease but the amount you will receive will still be same.